This is a series that hadn’t really been on my radar until last year, when I Winterling, also by Prineas. This spring, Charlotte wrote a Waiting on Wednesday post about how, while she liked Fer and Rook just fine, she was really anxiously waiting to find out what would happen to Conn. 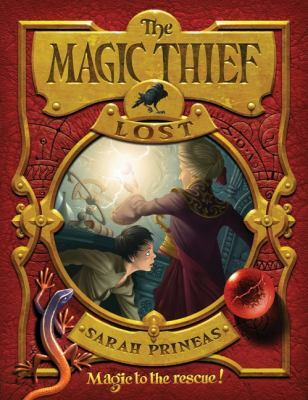 I thought that if Charlotte – and lots of other people – liked the Magic Thief better than the Winterling books that I had considered quite solid, I’d best get on reading them. Here’s a series that got slowly pushed to the top of my list by the sheer amount of fellow blogger love for it. I tried to speed through the first three books (as much as it’s possible to speed through audiobooks) so that I could read the fourth one in sequence, as it’s nominated for the Cybils and I’d have to read it anyway. I’ll do the best I can to talk about these books without too many spoilers. Connwaer is a pickpocket and lockpick living on the foggy, cobbled streets of Wellmet. One cold evening he picks a wizard’s pocket, and ends up not with coins, but with the wizard’s locus magicalicus, the stone tuned just to him that lets him do magic. Just touching this would kill most people – but as Conn doesn’t die, the wizard, Nevery Flinglas, decides to keep him around. Conn is determined to be Nevery’s apprentice, but the Council of Wizards will only accept him if he can find his own locus magicalicus. The magic in Wellmet is fading, and that means Nevery is too busy to help Conn – even though Conn thinks he has an idea what’s happening. But will anyone believe a former gutter boy? 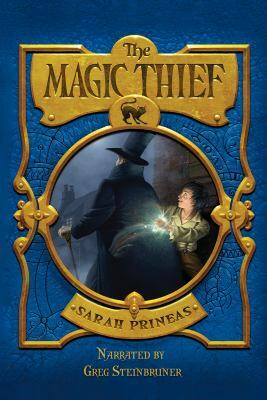 Besides Nevery, the supporting cast includes Bennet, Nevery’s tough bodyguard and housekeeper, who spends his time knitting when not baking biscuits or running Nevery’s errands; the red-haired, nonmagical wizard school student Rowan, assigned to tutor Conn in reading; and another wizard’s snooty young apprentice. The characters ought to feel like stock characters, but Prineas brings them all to life vividly and convincingly. The city of Wellmet is its own character, divided by a river into the well-off Sunrise, crowned by the Dawn Palace where the Duchess lives and the shady Twilight, run by the Underlord and full of narrow alleys and smoky factories. Conn himself is mostly what classical D&D would call a chaotic good character, willing to break all the rules to save the city – though for all his willingness to steal and pick locks, he is unfailingly honest. By the end of book one – spoiler! – Conn has saved the city, but is left unable to use magic and the wizards are unconvinced that Conn’s solution worked for the reasons Conn believed it did. Still unable to do magic the accepted way, Conn resorts to forbidden pyrotechnics to try to contact the magic of Wellmet. He’s driven to break the rules by arrival of evil Shadows, who arrive in the darkness and turn people to stone. When explosions that should have been small get out of control, Conn is banished from Wellmet. He manages to join up with Rowan, who’s being sent as an official envoy to the nearby desert city of Desh, the probable source of the Shadows. There they meet the Jagus, the young sorcerer king of Desh, surrounded by his creepy white cats. Once again, Conn’s ability to feel magic and his gutter boy skills combine to make him the only person who can solve the problems – even if he will need rescuing along the way. 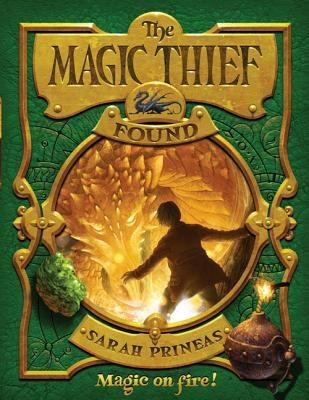 The Magic Thief Book 3: Found. by Sarah Prineas. Narrated by Greg Steinbrunner. Recorded Books, 2010. Conn is still officially banished, but hiding in Wellmet anyway – the magic needs him! He and Nevery can feel that the Dread Magic is on its way to Wellmet. Conn is desperate to find a locus magicalicus stone so that he can communicate with Wellmet’s magic and find out what’s going on. Once again, though, the spell involves pyrotechnics, and they get badly out of hand. Conn’s locus stone isn’t anywhere near Wellmet – and the punishment for returning is death. This story includes dragons, and an ending that must have been a nasty shock for people who didn’t know when or if book four would be available. 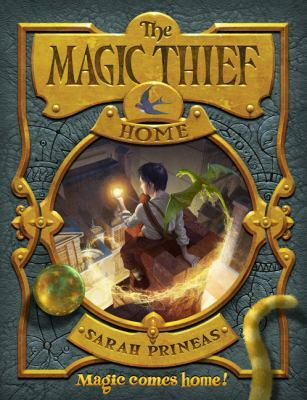 The Magic Thief Book 4: Home. by Sarah Prineas. Narrated by Greg Steinbrunner. Recorded Books, 2014. Now Rowan is officially Duchess of Wellmet and Ember the new Underlord. Rowan thinks that Conn is just the person to complete the trio, and names him as Ducal Magister. But nothing feels less like home to former gutter boy Conn than the white and gold apartments in the Dawn Palace with its wardrobe filled with silk robes. Rowan challenges him to tell her who he thinks he is if not the Ducal Magister – a stumper of a question, to be sure. But before they can finish the conversation, Rowan’s new secretary interrupts to call them away to the next official meeting. The meeting makes it even clearer to Conn that he’s in the wrong place – locus stones have been going missing, and the other magisters are convince that Conn must be responsible for them – made worse when his dragon, Pip, shows up carrying one. Wellmet has two magics now – Conn’s doing – and since they’re not playing nicely together, the magisters are less than grateful for Conn’s saving the city last time around. Conn determines to go underground to find out who is behind the thefts. Sure and certain, Conn will get himself into bad trouble before he gets things cleared up again, and there will be magic, explosions, and lots of racing through alleyways followed by minions intent on beating the fluff out of him along the way. All the books are mostly told by Conn, with short bits in Nevery’s clipped writing for his journal and, later on, somewhat more formal writings from Rowan’s diary, as well as letters between various major characters. Steinbrunner does a fantastic job reading them all in a variety of British accents – Conn’s voice is maybe a bit posher than one might expect from a gutter boy, but his enthusiasm and youth shines through, contrasted nicely with Nevery’s growly voice and Rowan’s definitely polished tones. But Conn’s own distinctive turns of phrase are also delightful – Nevery’s “clean glean looks”, the way Conn “blinks the brights from his eyes” after the frequent explosions. With a roguish main character determined to do right even when everyone else believes the worst of him and does their best to stop him, plus original magic, excellent villains, a small dragon, and lots of pyrotechnics, this is a book with heart and kid appeal in spades. I was utterly charmed. This entry was posted in Books and tagged dragons, steampunk, youth audiobooks, youth fantasy. Bookmark the permalink.